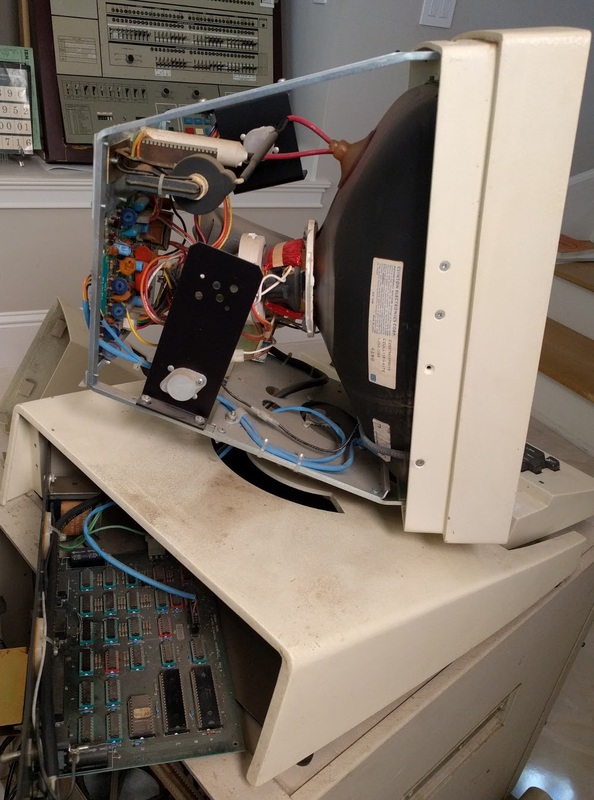 In this Alto restoration episode, we repaired a second CRT display, exercising our TV repair skills and discovering a tiny mysterious lightbulb that caused the display to fail in a strange way. For those just tuning in, the Alto was a revolutionary computer designed at Xerox PARC in 1973 to investigate personal computing. It introduced the GUI, high-resolution bitmapped displays, WYSIWYG editors, Ethernet and laser printers to the world, among other things. The YCombinator Xerox Alto, running a Mandelbrot set program I wrote in BCPL. I've been restoring an Alto from YCombinator, along with Marc Verdiell, Carl Claunch and Luca Severini. Since we have the YCombinator Alto working (above), we've been trying trying to get a second Xerox Alto system running; this one is from DigiBarn. My full set of Alto posts is here and Marc's videos are here. When we tried to connect the DigiBarn display to the Alto, we ran into a problem—it had an incompatible connector. 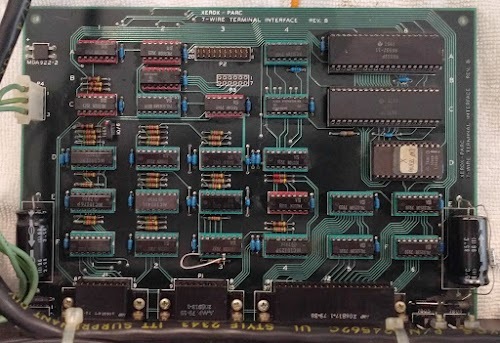 Looking inside the display (below), we were surprised to find this connector led to a circuit board with a 6502 microprocessor; since the Alto came out in 1973 and the 6502 in 1975, this didn't make sense. After some investigation, I determined that although the display looked like an Alto display, it was actually for a Dorado, a Xerox minicomputer from 1979 that followed the Alto. Inside the Xerox Alto's display. With the cover removed, the CRT and monitor circuitry are visible. The 7-wire interface board is at bottom-left. The Alto itself is in the cabinet under the display. To connect the Alto to this display, I built an adapter cable that bypassed the 7-wire board. We hooked up the monitor, powered it on, and were greeted with a empty black screen. Given the age of the monitor, we weren't surprised that it didn't work. However, when we powered off the monitor, we saw a perfect image for a fraction of a second before the image collapsed to a dot and disappeared. This was unexpected—the monitor didn't work at all when powered on, but worked fine (but very briefly) when turned off! What could be going on? Since many readers may not be familiar with how CRTs work, I'll take a brief detour and explain how CRTs work. The cathode ray tube (CRT) ruled television displays from the 1930s until LCD displays took over about 10 years ago.2 In a CRT, an electron beam is shot at a phosphor-coated screen, causing a spot on the screen to light up. 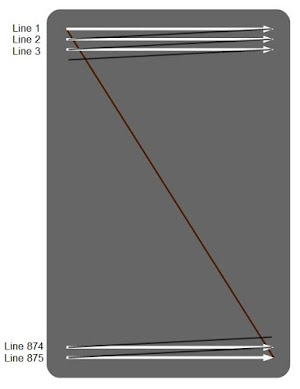 The beam scans across the screen, left to right and top to bottom in a raster pattern. The beam is turned on and off, generating a pattern of dots on the screen to form the image. The horizontal scan will turn out to be very important to this repair. 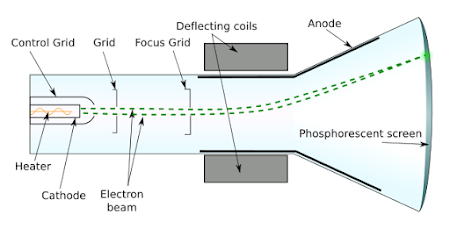 The cathode ray tube is a large vacuum tube containing multiple components, as shown below. A small electrical heater, similar to a light bulb filament, heats the cathode to about 1000°C. The cathode is an electrode that emits electrons when hot. A control grid surrounds the cathode; putting a negative voltage on the grid repels the negatively-charged electrons, reducing the beam strength and thus the brightness. The next grid has about 800 volts on it, attracting and accelerating the electrons. 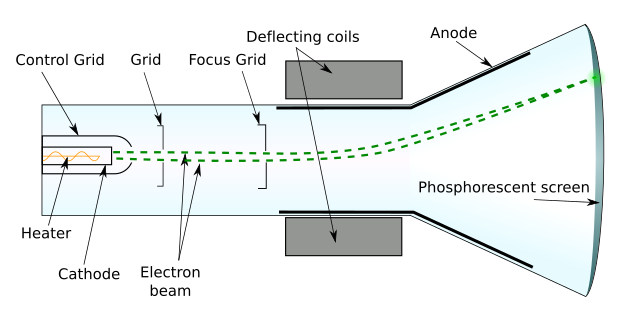 The focus grid, at about 600 volts, squeezes the electron beam to form a sharp spot. The anode is positively charged to a high voltage (17,000V), accelerating the electrons to hit the screen with high energy. The screen is coated with a phosphor, causing it to glow where hit by the electron beam. Finally, two electromagnets are arranged on the neck of the tube to deflect the beam horizontally and vertically in the raster scan pattern shown earlier; these are the deflection coils. The photo below shows the Cathode Ray Tube (CRT) inside the Alto's monitor, with the screen at the right. In the center, the red deflection coils are mounted on the neck of the tube. The thick red wire provides 17,000 volts to the anode. This high voltage is generated by the flyback transformer, the UFO-like gray disk in the lower left. 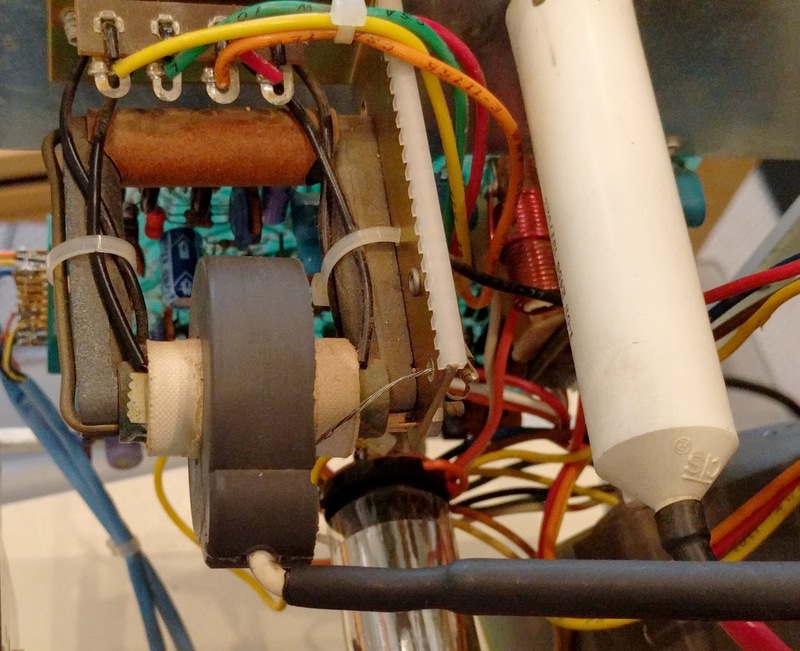 Inside the Xerox Alto's display, the CRT picture tube is visible. The thick red wire provides 17,000 volts from the flyback transformer to the tube's anode. The other red wire is connected to the 500M&ohm; 6W bleeder resistor, the large white cylinder at the left. Note the dirt and debris on the flyback transformer from the system's storage in a barn. We opened up the display and measured some voltages, taking extreme care around the high voltages. Verifying the 17,000 V supply was easy; with a voltage this high, waving an oscilloscope probe a few inches away is sufficient to pick up a signal (below). The main 55V supply was also good. But when we checked the grid voltages, we didn't get anything. The service manual shows the waveform you can pick up two inches away from the flyback transformer. The grid voltages and 17KV supply are generated by the flyback transformer. Since we saw the 17KV signal, we knew the horizontal deflection circuit and the flyback transformer were working. Perhaps a capacitor had failed, but we didn't find any bad ones. On the schematic we noticed a tiny lightbulb in the high-voltage circuit, an unexpected circuit element. We measured the bulb's resistance on the board (below) and found it was open. We figured the bulb must have burned out, but after removing it we discovered that instead one of the bulb's leads had broken off right at the glass case. The bulb is visible in front of the right side of the transformer. The service manual for the monitor called the bulb a "No. 1764." I was afraid that this was an internal part number and we wouldn't be able to determine the correct replacement bulb. 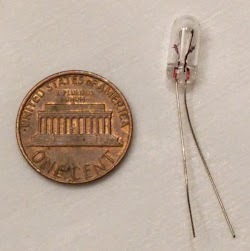 However, Google revealed that this was a 28V 0.04A miniature bulb, sold by many vendors. Unfortunately we couldn't find any local stores that sold this bulb and we wanted to test out a fix immediately. So Marc performed some precision microscope soldering to reattach the broken wire. Since the wire had broken off right at the glass, reattaching it was very difficult but he succeeded. We re-installed the bulb and the display worked fine! Why is there a bulb inside the power supply? I assume that it is used as a current limiter. Bulbs have very low resistance when cold, but increase resistance as they warm up. It seems crazy to subject a 28 V bulb to pulses of 600 volts, but since the pulses are only a few microseconds, the bulb survives them just fine. 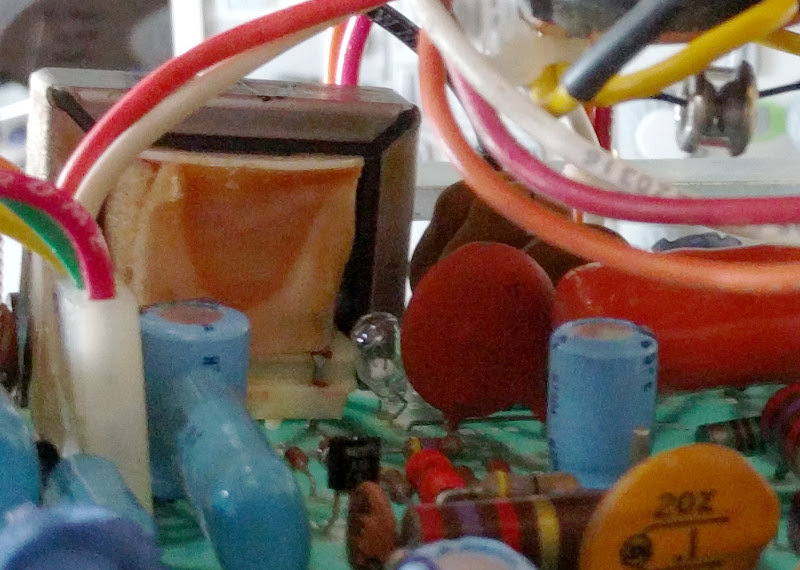 The tiny bulb inside the display's power supply. The photo below shows the flyback transformer (left). The thick black wire at the bottom of the photo connects the 17KV from the transformer to the picture tube, while the colorful wires at the top provide the lower voltages. Flyback transformer inside the monitor. The large white cylinder is a 500 megaohm, 6W resistor. You don't usually see such a high resistance combined with a high wattage, but the resistor bleeds off the high voltage from the CRT. The schematic below indicates the key components of the power supply. The switching transistor is driven by the horizontal sync input. When it switches on, current (red line) builds up in the flyback transformer, storing energy in the transformer's magnetic field. When the transistor switches off, this stored energy is released into the secondary windings, producing 17KV for the anode and -100V for the brightness grid. In addition, a 600V pulse is created across the primary. The pulse (yellow line) flows through the bulb and a diode, generating 600V for the focus grid. The voltage doubler circuit (circled in pink) generates 1000V for the second (accelerator) grid. 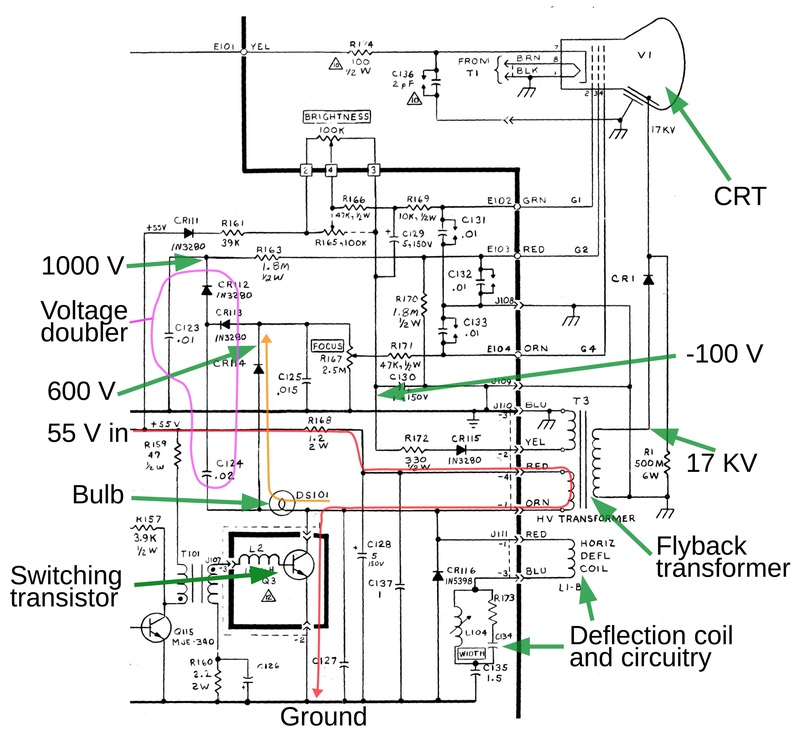 The high-voltage power supply is driven by the horizontal deflection circuit. The switching transistor puts 55 volts across the flyback transformer. When it switches off, the flyback transformer produces 17 kilovolts for the CRT anode, as well as powering the 600V, 1000V and -100V supplies. Why did the display originally show a picture for a moment as it was powered off? With the bulb not working, the 800V acceleration grid and the focus grid didn't receive any voltage, but the brightness grid was still powered (since -100V comes from a different winding). 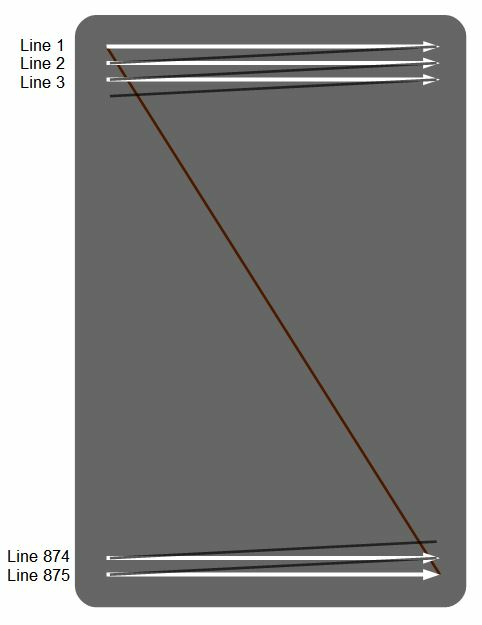 My theory is that without the attraction from the acceleration grid, electrons couldn't get past the negative brightness grid. But when the brightness grid lost power, the electron beam was no longer blocked and could reach the screen, until everything else shut down moments later. Cathode ray tubes were the dominant display technology until LCD displays took over about 10 years ago. 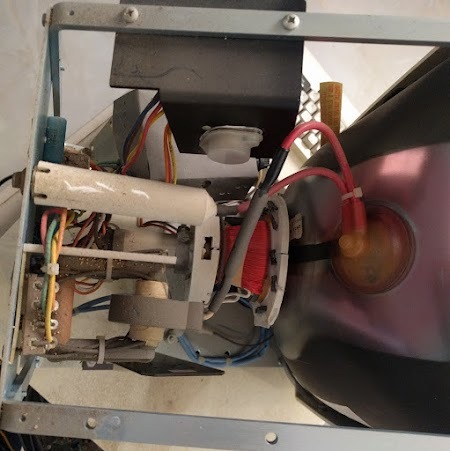 Now, CRT TV repair is a retro activity, involving circuits such as horizontal deflection, video amplifiers, and high-voltage flyback transformers that were formerly well-known but are now more obscure. We tracked down the display's problem to a tiny light bulb, an unusual component to find in a critical role in a high-voltage power supply. Surprisingly, despite being exposed to 600 volt pulses, the problem with this 28 volt bulb wasn't that it had burnt out, but that one of its tiny leads had broken. After repairing the bulb, the display worked fine. 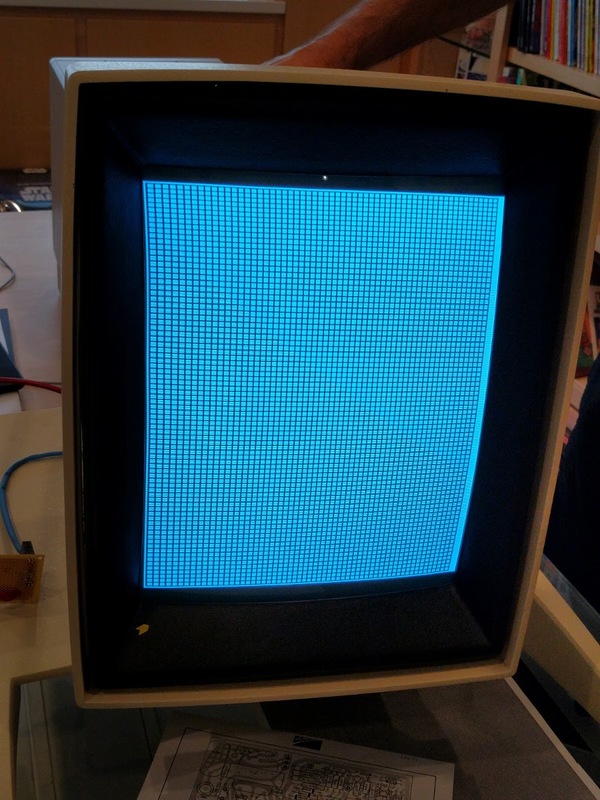 Unlike our previous display which had a very faint CRT, this one produced a crisp, bright image. Since we got the display working and didn't get any high-voltage shocks, I consider this a successful restoration session. The repaired display shows a test pattern, generated by the crttest program. The screen is bright and sharp, but the horizontal centering still needed adjustment. Thanks to the Living Computer Museums + Lab for providing the display test board. Thanks to Al Kossow and Bitsavers for the scanned service manual. The 7-wire interface used a 15-wire cable with standard DB-15 (serial port) connectors. It sent seven ECL signals as differential pairs, and used the remaining wire for ground. Calling it "7-wire" seems a bit misleading, since it used 15 wires in total. 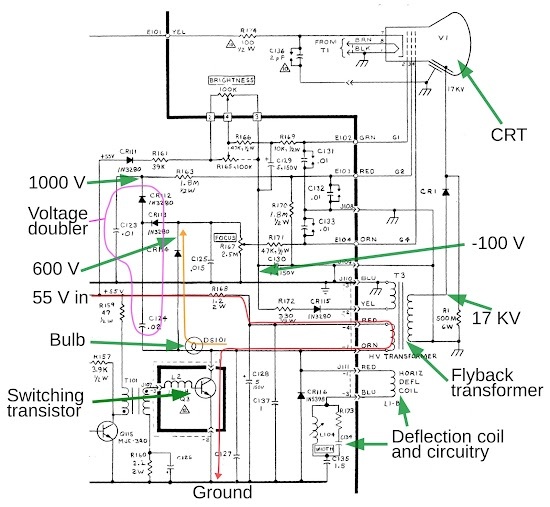 The board schematic is in the Dorado schematics page 159. The video signal was multiplexed across four of the signals; this reduced the bandwidth requirement by a factor of four. One signal was serial data; this transmitted the keyboard and mouse information. The remaining two signals were (apparently redundant) clocks. The protocol supported daisy-chaining, so multiple peripherals (such as a printer) could be connected. The bulb is not a current *limiter*, it's a fuse. And it is never exposed to a 600V stress under non-fault conditions: it behaves as a low-value resistance. Since the failure was a broken lead on a not-burned-out bulb, you would almost certainly have been okay just jumpering it (a priori - given what happened after the difficult repair of the bulb that is, of course, quite certain). This "off-label" use of small incandescent bulbs was fairly common in CRT circuits, BTW. Interesting -- so why not just use a fuse? Why is a fuse needed at all here, for that matter? Maybe it's useful to be able to look through a vent hole and see if a light has burned out to determine if the "fuse" needs to be replaced. Take off the cover, turn on the unit, no lightbulb means blown fuse. Easy indicator. The dirt on the HV transformer is normal.High positive voltage draws in negative charged dirt and dust.My first real job out of high school was fixing tube driven TV sets. They could actually be easier to fix. So what type of component would you use to replace this bulb today? A regular fuse with the approporiate values? Comments talk about how using bulbs off-label like this was normal back in the day. I used to fix DEC VR299 monitors and replace boards, but I don't recall any bulbs... but now that I think of it, there was a glowing orange thing at some point, but that could be my memory playing tricks. Thanks for the blog, it's a font of useful info! I once worked on an old vacuum tube-based organ. One part of the circuit used a neon lamp as a voltage regulator. When the rear cover was removed from the organ, it worked. When the cover was replaced, it did not. There was an incandescent bulb installed next to the neon bulb, to insure that the neon bulb would turn on at the proper voltage. When the incandescent bulb died, so did the organ. Removing the cover allowed enough light to hit the neon bulb for it to operate correctly. With 600V across it when open circuit, that small bulb would likely arc, making it a poor choice for a fuse. The service manual has trouble-shooting section and there is no mention of this bulb, suggesting they did not expect it to fail. As Ken suggests, the most likely purpose is current regulation - not an uncommon trick in the day. Not a fuse at all, of course. It's a negative resistance element to regulate the high voltage supply, as the author correctly identified. I would like to thank you for the detailed description on what that tiny bulb does in the circuit. I found it very useful. I love watching you and Marc repair old electronics, so again, thank you very much! I recently did some re-capping on a TRS-80 Model III and found that it has a small neon indicator lamp jumpered across two of the terminals at the CRT socket. Prior to the re-capping exercise, I saw the neon lamp light for a second or two at power-on, but afterwards, the neon light seems to remain out at all times. Someone on the VCFED boards opined that it wasn’t actually supposed to be lighting and if it did, it was acting as circuit protection. The filament of the CRT glows fairly brightly for a second or two at power-on as well, but settles down to a dull low-intensity red glow as it heats up.